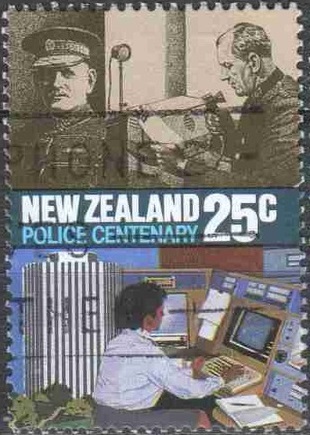 Virtual New Zealand Stamps: Centenaries 1985 & 1986. This post covers two issues celebrating centenaries of two organisations that do much to support our way of life in New Zealand. The first is the St John's Ambulance, always there in times of need, giving on scene first-aid and life-saving transport to hospital. 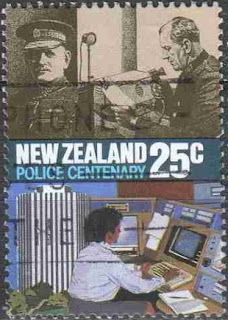 The second organisation is the New Zealand Police. 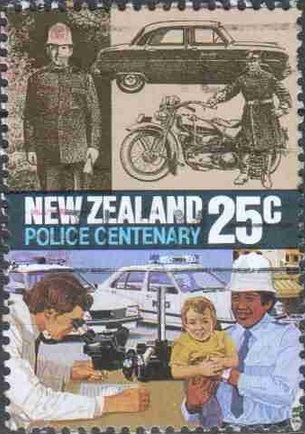 A strip of five stamps illustrating the varied facets of police work - old and modern. 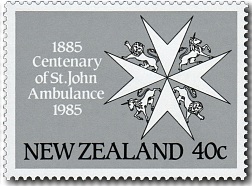 1985 Centenary of St John's Ambulance. 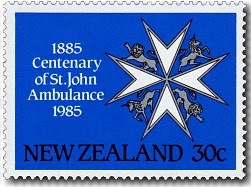 1085 is one hundred years since the St John's Ambulance Association was established in Christchurch. To mark this event NZ Post issued a three value set showing the three crosses connected with St John's. This post looks at the history of the St John's movement going back hundreds of years before it became the organisation we know today. 24c - Bailiffs and Dames Grand Cross on Red. The Maltese Cross, lions and unicorns of the St John insignia have become a familiar symbol in New Zealand since the St John Ambulance Association was first established at Christchurch in 1885. But the origins of the organisation go back much further. The story begins over 1000 years ago. Around 600AD a small hospice was founded in Jerusalem by Pope Gregory and continued to give assistance to Christian pilgrims for another 500 years. In 1099 Jerusalem was taken by the soldiers of the 1st Crusade. The hospice had a Norman monk, The Blessed Gerard, who persuaded the Crusaders to formally set up the Order as we know it today. Its destruction 400 years later by the fanatical Caliph El-Hakim could not destroy the spirit in which it began. The citizens of Amalfi, Italy, restored the hospice in the Holy Land 13 years later, dedicating it to St John the Almoner, and placed it under the control of the Benedictine Order. 30c - Knights and Dames of Grace Cross on Blue. The hospitallers in their black habits adorned by a large, white, eight-pointed cross were given military duties in defence of the Holy Land, yet never relaxed their vows of chastity, obedience and poverty. Drawing sword only when their Standard of the Cross was displayed, their power and influence spread throughout Europe. When Jerusalem fell the Order was forced to move, first to Cyprus, then Rhodes and finally in 1530, to Malta. There a great hospital was built and the Order ruled rich and powerful until invaded and exiled by Napoleon. The Order of St John finally settled in Rome where it remains to this day. 40c - Serving Brothers and Sisters Crest on Grey. The Order of St John of Jerusalem was revived in England in 1831 after a lapse of three centuries. 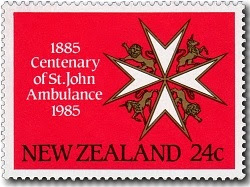 Public concern over the lack of first aid knowledge and inadequate facilities for transporting the sick and injured to hospital led to the 1877 formation of a St John Ambulance Association. Ten years later the St John Ambulance Brigade was formed. The Association's early work in New Zealand involved practical assistance at accidents and far-reaching courses in first-aid. Under the motto "In Service of Mankind" both the St John Ambulance Association and the St John Ambulance Brigade have moved into many fields, keeping pace with changes in medical knowledge and the increasing needs of an expanding population. 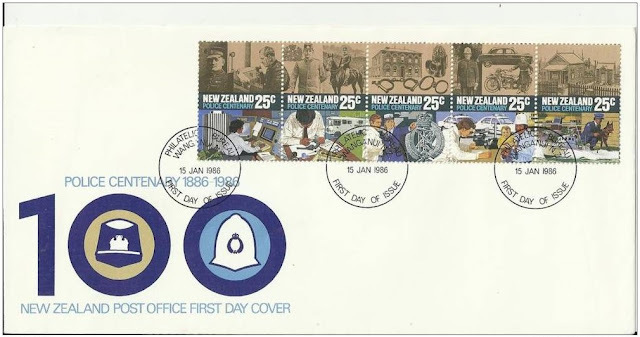 1985 St Johns Ambulance First Day Cover. 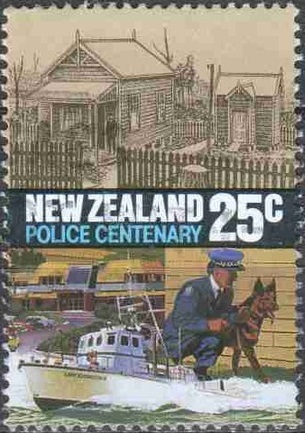 This cover shows a postal address having been used postally. The New Zealand Police, the men and women in blue, are always there when society needs them. Often it is not appreciated how much they do so this issue sets out show us some of the many different aspects of police work and how it has changed over the past 100 years. 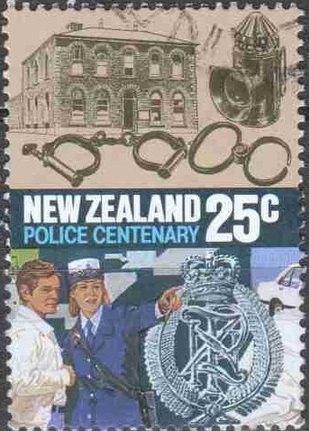 Se-tenant strip of five stamps illustrating the varied facets of police work - old and modern. 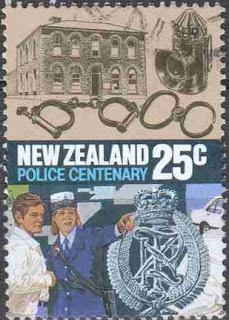 Although the centenary of policing in New Zealand was commemorated in 1986, the story actually began in 1840. New Zealand was at that time governed from New South Wales in Australia and at the request of Governor William Hobson, a group of Victorian Mounted Police were brought across from Australia for policing duties. 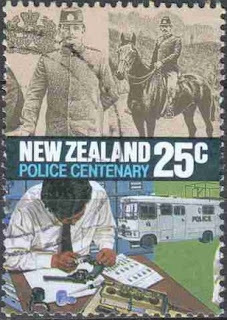 From this came the establishment of New Zealand's Police Magistracy Forces. Six years later, the new Governor, George Grey took heed of an influx of European settlers. A means of law and order enforcement was needed, and Grey established an armed Police force. For the next 40 years, the Police force was responsible for preserving the peace and undertaking military duties as necessary. The police remained under military control for many years. It eventually became obvious that a Police force separate from the military was required and on 1 September 1886 the Police Force Act brought about the severance of police operations from those of the armed forces. Each stamp contains a scene from the past in sepia tones and a scene in colour of the modern force. Together the stamps form a montage of people, uniforms, equipment and buildings. 25c - Communication. 25c - Launch. 25c - Badge. 25c - Vehicles. NZ Police First Day Cover. This strip of all five stamps shows a major shift in the colour used in the older section of each stamp. The catalogue said this was a perforation shift but the perfs fit perfectly to the lower pictures. The white gap that has appeared across the centre of each stamp tells me this is a colour shift. Technical information - St John's Ambulance. Technical information - New Zealand Police.